The opening shot across the bow comes with an ear-splitting explosion out of which a magnificent glistening gold crucifix forms and hangs in the firmament above the church square. The crowd draws its breath in a gasp and the fading crucifix is replaced by a fiery row of red and silver fountains above which barrages of colour explode across the night sky in rapid fire. Vivid sunbursts spread like blossoming stains; tiny whorls race around the firmament like tadpoles released into a stream; shooting stars run amok in psychedelic rain and scatter gun air bombs rip through our ears and vibrate the windows of the houses. 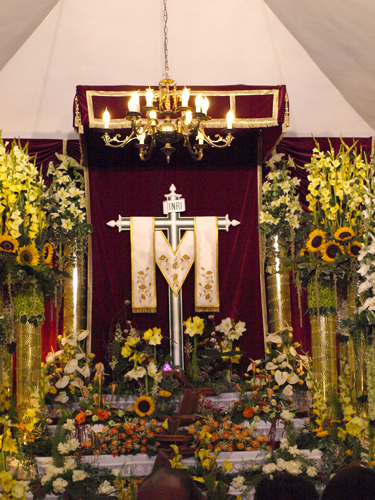 Last weekend was Fiesta of the Cross; a traditional fiesta dating back to the conquest in 1496, during which every cross on the island, from the humblest wooden crucifix placed in the open window of a small cottage to ornate gilded processional crosses carried on the shoulders of devotees, is decorated with flowers, candles and incense. 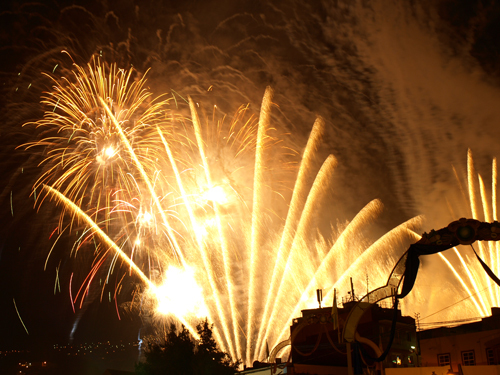 In Los Realejos Alto in Northern Tenerife, the day is traditionally rounded off by Europe’s largest firework display. Originating from the rivalry between two firework factories in the municipality, one aligned to Calle del Sol, the other to Calle del Medio, the 3rd of May displays take the form of pyrotechnic aerial skirmishes between the two streets and the still, black, night sky provides the battleground on which the factory armies of Los Realejos wage war with their gunpowder cannons. When the first display finally subsides the rival street retaliates. But the still night air contrives to hold the smoke pall hostage and much of the display is lost within its murky mass; it’s a dastardly ploy, perfectly executed. Though the sky blazes red and pulsates with the beat of the strobe-lit explosions, all that can be seen from the little church square are fiery comets which thunder from behind the veil and hurtle towards the earth; tantalising glimpses of clouds of gentle fairy dust twinkling behind the haze and slender ribbons of jewelled lights suspended above the valley for what seems like an eternity. Silence falls and the smoke cloud drifts painfully slowly across the plaza where we’re standing and where crowds are now converging to watch the finale. With all eyes trained on the football stadium, we wait, and wait…and wait. After an hour of silent skies, the cold night air of Los Realejos Alto in early May starts to diminish enthusiasm for the contest and people begin to drift away, unsure of what has happened to the final battle. I head back to the car and join the queue for the motorway, the air conditioning turned to warm for only the second time in the car’s four year life. All the way home I’m accompanied by the air raid soundtrack of the delayed final denouement and in the rear view mirror I can see the night’s bloodstained front line. 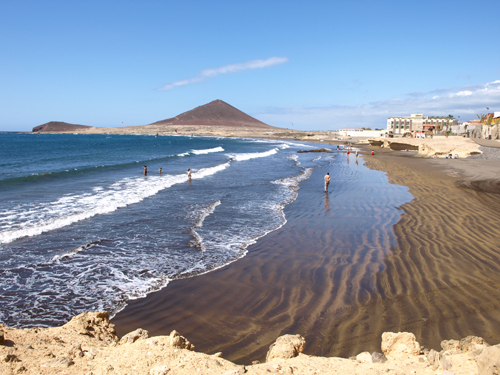 In Tenerife it seems, even a war succumbs to the ‘mañana culture’. In the unlikely setting of a basketball court in Los Realejos Bajo on Friday night the Cuban hip hop band ‘Orishas’ took to the stage in an atmosphere of euphoria, and not until they’d gone through their entire repertoire would they leave. Even then, they were still thanking the audience and promising to return as they finally disappeared backstage. From the moment they stepped into the lights amidst tumultuous applause, whistles and screams, through a set that lasted for almost two hours (including a fake ending after which the encore lasted as long as the set had) the audience punched the sky, aerial clapped, bounced, swayed and hollered along to every number. 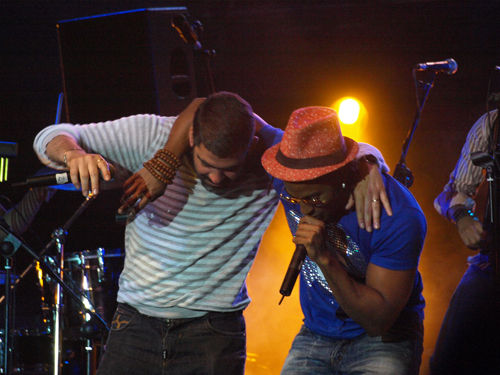 Formed in Cuba as one of the many hip hop bands performing in the country, Orishas achieved international recognition in 1999 and now live outside of their home country, recording their music in Paris. Adding Salsa and Latino rhythms to the hip hop, Orishas have developed a hybrid sound that goes to the feet like dancing lessons. Their lyrics celebrate the racial mix that exists in Cuba, in defiance of Castro’s colour blind manifesto. Orishas sang, danced and entertained as if their lives depended on it. By the time they were finally close to bidding “Buenas Noches”, they climbed down into the press area to get even closer to the frenzied crowd and performed this year’s Santa Cruz Carnaval anthem, ‘Hip Hop Congo‘. Yotuel took a small boy from the audience onto his shoulders for the closing number. It was heart warming and indicative of the attitude of Orishas who had behaved all night as if every single person there was a member of the family. Finally sated, exhausted and euphoric, they headed to the beer tent to top up fuel levels up on vodka and Red Bull to get them through the rest of their Friday night … and that was just the audience. Suntanned, scantily-clad hippie chicks ribbon danced and sold handmade jewellery and head accessories from stalls alongside the beach while their tattooed, dread-locked boyfriends juggled diabolos around a uni-cyclist; this was Glastonbury’s Green Fields without the mud. The sun was blazing down as it had done all weekend as I headed down the steep hill towards the idyllic cove of El Socorro. From the vantage point of the road I could see a narrow landing strip laid out along the black sand and behind it, rows of people were sunbathing. In the sand flats beyond the shore a group of bathers were lying while the sea gently lapped their bodies. 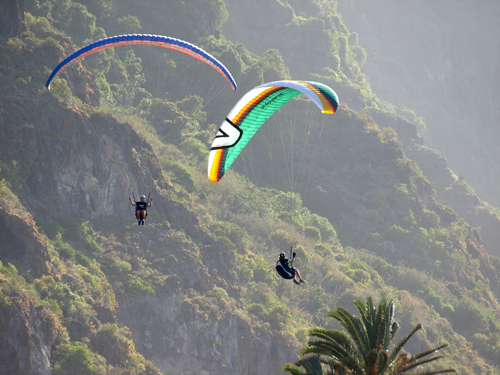 Above the beach, the sky was filled with the rainbow silks of paragliders dancing like butterflies on the warm air currents and gently floating down above the heads of the sunbathers. From the stage the Weather Girls blasted out “It’s Raining Men ” as one by one the paragliders touched down on the sand and gathered up their sails to the applause and whistles of the onlookers. In between landings, Amy Winehouse’s ‘Rehab‘ and The Scissor Sisters’ ‘I don’t feel like dancin‘ were amongst the sounds blasting out from the DJ’s decks while on stage a band tuned up in readiness for their appearance later. It wasn’t just the fireworks this weekend that lit up the cloudless skies of Los Realejos; for the fourth year running, the municipality staged the aerial festival of FLYPA 2008 (Festival International de Parapente de Los Realejos) which, over the course of four days, saw hundreds of rainbow silk sails gliding down from La Corona to the beach of El Socorro and the harbour of Puerto de la Cruz. The sun began to set and preparations got underway for the night’s beach party. There was to be a nocturnal paramotor show, a live band, a giant paella and more fireworks. I desperately wanted to stay but I was completely partied out by the weekend’s activities. Reluctantly I climbed back up the hill, passing hordes of people making their way down to the party. For the first time in my life I was glad the weekend was over and I could look forward to Monday. And in my head all I kept thinking was…there’s a whole lot more to Los Realejos than meets the sky.